Half the fun of knowledge is the research or journey to gain said knowledge. Not everyone in life processes the ability to find those hidden gems through tedious labor. Some of us need a guide to help us traverse the many pages of texts, obscure and well known, for the proper quotation or reference; that one sentence, definition, or thought which will enlighten our writings or ourselves. To be quite honest, a lot of us were CliffsNotes kids—short-cut students in a short-cut society. For us, there is no greater pleasure than the tedious made simple. 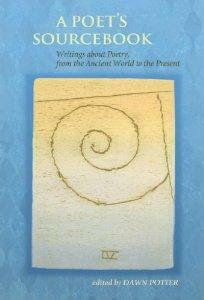 A Poet’s Sourcebook, edited by Dawn Potter for Autumn House Press, is one of those guiding texts. What Ms. Potter has amassed here is a reflective guidebook, one that covers her journey as a poet and writer through the voice of those poets who have help mold her over the course of her writing life. This personal connection to the writers and their works chosen for this text is one of the book’s strengths. The connections between the poets’ work and their thoughts on said work, regardless of century or millennium, shows a direct correlation between writing and the soul, writing and dreams, and most importantly writing and a universal truth for the collective and the individual. This text has another unique and personal feature: two Tables of Content (the short-cut kid inside of me loves this facet of the book). The first is chronological, establishing the ancient voice of the text through Sapho, Plato, and Aristotle, while bridging that distance with well knowns such as Whitman, Frost, Pound, and Elliot, until a connection is made to modern day voices such as Rita Dove and Brenda Shaughnessy. Every writer represented receives a short bio before his or her work, which again aids any student who happens across this text in search for research paper gold. Unfortunately, the content follows the chronological Table of Contents. I feel the text would be much more compelling if the second Table of Contents had been employed. This one arranges the text by theme: The Art of Poetry, Poetry and Death, Poetry and Dream, Poetry and Protest, etc. The formatting of the book in this way would have given more breadth to the conversation these poets are having through the pages. This would have enabled a deeper understanding of each work presented, their differences in fundamental truths, and highlighted how their foundations are similar. For Ovid’s and Poe’s thoughts on the task of poetry to be placed in close proximity would have made the correlations of their conversations more tangible and immediate to the reader. Overall, I think this book will serve the needs of students who are gaining insight to the world of writers and poets. This text is a great tool for anyone writing a research paper or looking to expand a knowledge base in the arena of poetry. A Poet’s Sourcebook and Dawn Potter’s love of the writers and poets presented will surely leave an indelible impression on most anyone who comes across it. Jason Carney has been touring the national performance poetry scene for the past ten years. He has appeared on several seasons of the HBO television show Russell Simmons Presents Def Poets and he is a four time national poetry slam finalist. Jason has spoken and offered workshops at high schools, juvenile detention centers, corporate diversity engagements, as well has colleges and universities extensively in the fifty states. He has an MFA from Wilkes University and his memoir, Starve The Vulture, is forthcoming from Kaylie Jones Books.